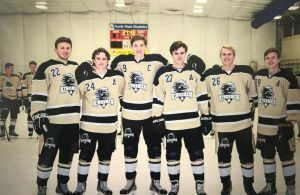 Penn Kingsmen Hockey faced off against one of its all-time great rivals, the St. Joseph Indians. The Kingsmen battled hard but St. Joe scored a 5-4 victory in overtime. The Indians started the scoring in the first couple minutes but the Kingsmen battled back and scored two back-to-back goals by Senior Charlie Platt and Carson Cocquyt, with an assists coming from Jordan Lindzy. After the Indians knotted the score at 2-2, the Kingsmen scored another set of back-to-back goals in the second period. Carson Cocquyt and Ryan Calhoun each lit the lamp to push Penn’s lead to 4-2. The Indians put one more in the back of the net to end the second period to trim the Penn lead to 4-3. St. Joe put one in the back of the net late in the period to send the game to overtime.